There is something so satisfying about warm breakfast. Whether it’s sweet or savory, I’ve always loved a warm start of the day, especially during the colder seasons. 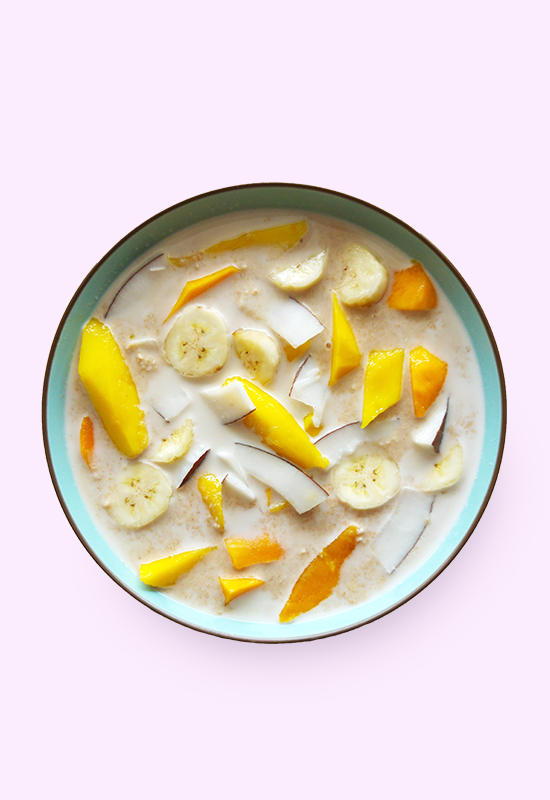 This filling coconut mango porridge is packed with fiber, proteins, vitamins, minerals and other goodness. It doesn’t only satisfy your taste buds but provides you with lots of energy too. Although porridge is a popular breakfast dish, it makes a great meal or snack for any time of the day really. I used to make this tropical bowl often when I was in Koh Samui. With all the amazing fresh fruit there it’s a true flavor delight. This coconut mango porridge is made with 4 types of Thai mangoes from the local market, wild bananas and fresh coconut found at the nearby beach. Ultimate freshness. You can of course use any type of fresh mango. What makes this porridge really creamy is the coconut milk. 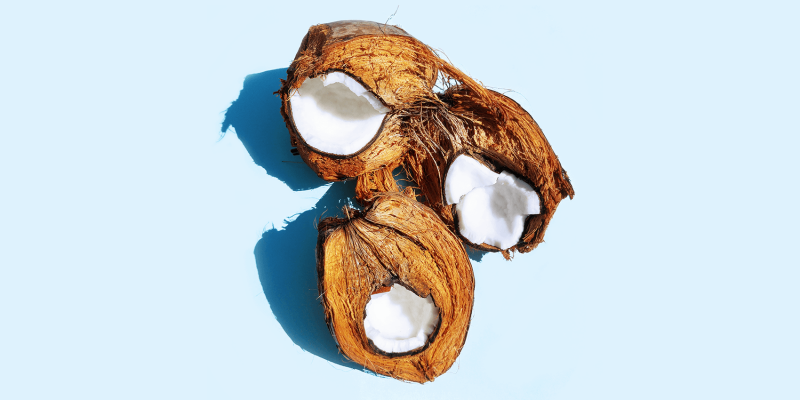 You can easily make your own from fresh coconut, but store-bought coconut milk is also fine. Make sure to choose a natural one without added sugar or flavoring. I use overnight soaked rolled oats for this simple recipe. Soaking the oats makes them more digestible and brings out the maximum nutritional benefits. This is due to the phytic acid found in grains, nuts etc. which blocks the nutrients. Phytic acid impairs the absorption of iron, zinc and calcium and may even promote mineral deficiencies. Eating soaked oats doesn’t affect the taste, but by doing so you’ll get the most out of its amazing nutritional value and of other foods that you eat! Soak the oats overnight or for a minimum of 7 hours in coconut milk and a splash of lemon juice. Cook the soaked oats in coconut milk on low fire while stirring. 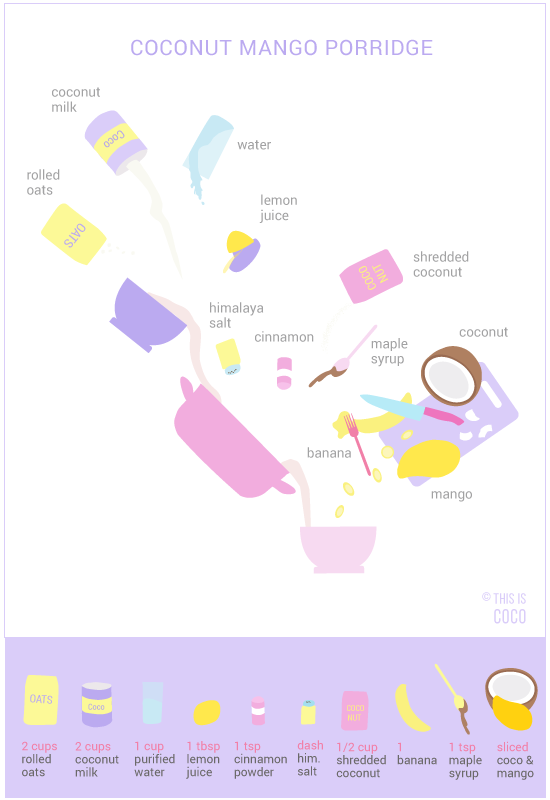 Add your sweetener of choice; I like to use for example maple syrup or coconut nectar. To bring out the flavor add a pinch of sea or Himalaya salt and some powdered cinnamon. 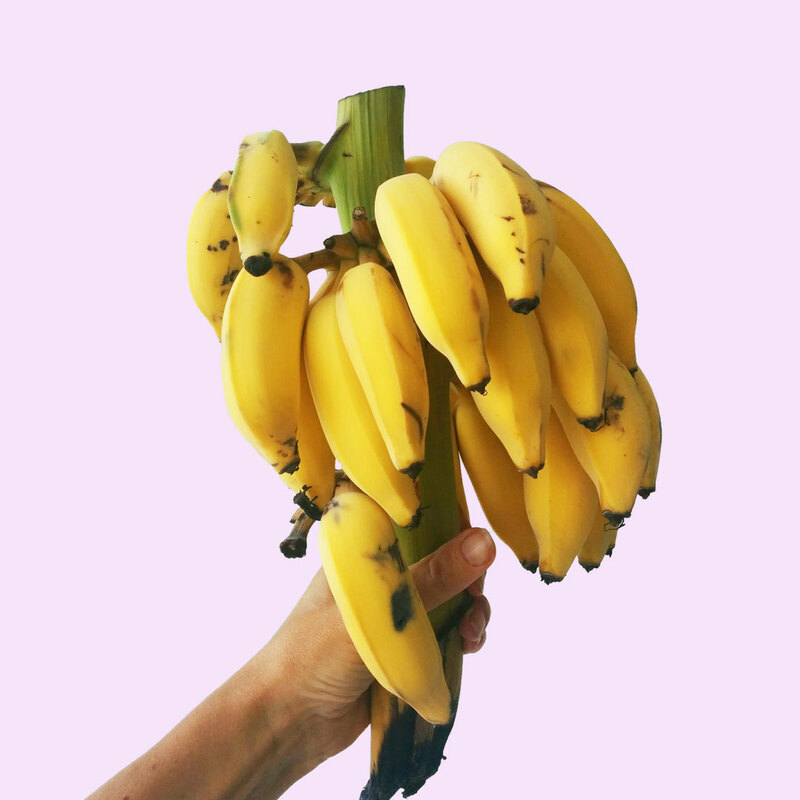 Mix in the sliced mango, banana and fresh coconut and enjoy it while it’s warm! This looks sooo good! Great tip about soaking the oatmeal, I had no idea. Going to make this on the weekend. Oats are gluten free right? Thanks Andrea! Yes, oats are gluten-free, but they are sometimes produced in places that produce gluten as well. There are brands that sell 100% gluten-free oats, so you might want to look into that.